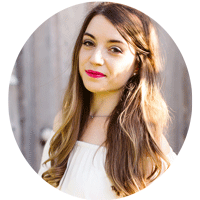 When I first heard about the Autoimmune Protocol (or AIP) diet, I felt the same way that most do… overwhelmed! What the heck was okay to eat? What wasn’t allowed? 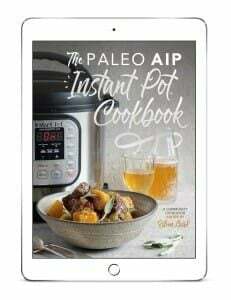 I have tons of AIP recipes on my blog, and now I’m excited to be sharing a complete AIP diet food list along with printable PDF guides, and explanations as to why certain foods are and are not compliant. First, what is the AIP diet? The autoimmune protocol diet is designed to lower inflammation to allow the body to heal. It’s meant to be a short-term protocol to allow inflammation to reduce while healing autoimmune disease. 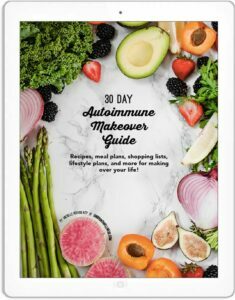 You can read a full guide to the autoimmune protocol here! Does the AIP diet work for everyone that has an autoimmune disease? No. Does it help many? Yes! There are so many other factors in healing autoimmune disease rather than just diet alone, such as addressing infections and imbalances, sleep, stress reduction, movement, lifestyle changes, and more. We can’t expect diet alone to heal everything. However, food has a powerful impact that cannot be denied. In this blog post, we’re going to be focusing specifically on the foods that are allowed and not allowed on the autoimmune protocol, and a brief explanation as to why. And for quick reference, I’ve also included PDF printable guides to take along with you and even fit in your wallet! Click to Download the Printable Guide. Both vegetables and herbs are rich in phytonutrients, and fiber that allow our bodies to thrive! Though the AIP diet still included animal protein, it’s still highly plant-centric as it suggests up to 9 servings of vegetables a day. 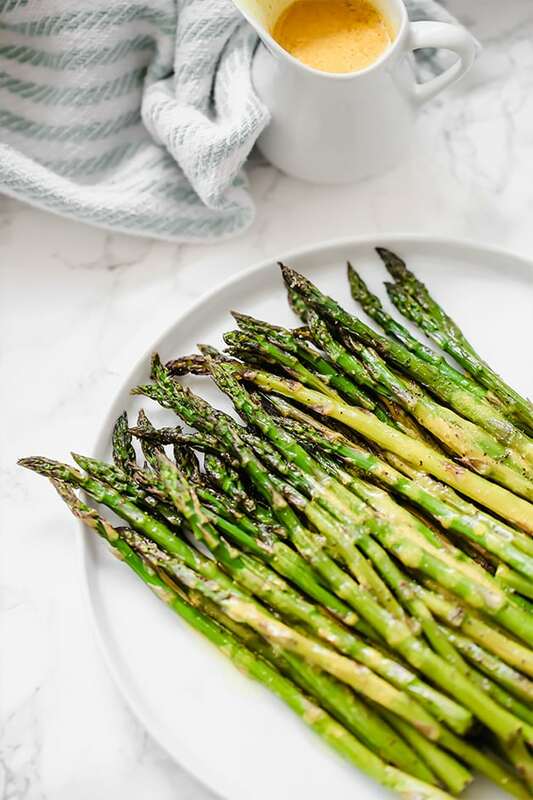 Get the asparagus recipe pictured below. Fruits are fiber rich and many contain antioxidants that protect the cells from damage. It’s recommended to not overdo fruit and to stick to around two servings a day. High quality animal protein provide us minerals, healthy fats, and much needed energy. Animal protein is highly debated, but the AIP diet advocates for animal protein as a healing food. High quality choices like grass-fed, pasture raised and wild caught are preferred when possible, but do the best you can! Healthy fats regulate the inflammation process in our body, act as a carrier for nutrients, and allow us to stay satiated! Healthy fats are incredibly important to include at every meal to keep you full, and keep your body on a healing path. 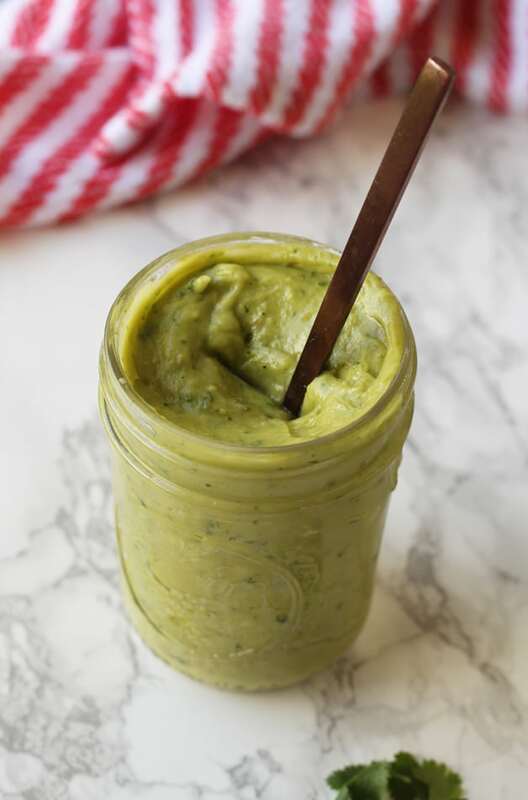 Click to get the cilantro avocado lime sauce recipe pictured below. Those suffering from autoimmunity are also dealing with some level of intestinal permeability. Gluten and grains can promote intestinal permeability (or a leaky gut) and are best avoided while you’re trying to allow the body to heal. Dairy can impact the integrity of the gut lining and stimulate allergies and inflammation. High quality dairy may be fine in moderation for some after healing, but it’s avoided during the AIP diet. Legumes like beans can be damaging to the gut lining and are best avoided while trying to heal. Nightshade vegetables can trigger inflammation, especially in those with joint issues. Nuts and seeds (and seed spices below) can be inflammatory to the gut lining. These are often safely reintroduced when they’re properly soaked and sprouted. Alcohol just doesn’t promote healing. It may be enjoyed in moderation after healing has taken place. Eggs are one of the most common allergens and can irritate the gut. Yolks are less irritating than whites, and many are able to reintroduce yolks more easily than whole eggs. Additives like gums, food dyes, and sugars don’t promote healing. Natural sugars like honey, maple syrup, and coconut sugar are fine in moderation. Is this all overwhelming? Grab my wallet size cheat sheet! Okay, that was a lot. Even those that have been in the AIP community for years still question some of the nitty gritty when it comes to what is and is not compliant. You don’t have to memorize this list front and back! 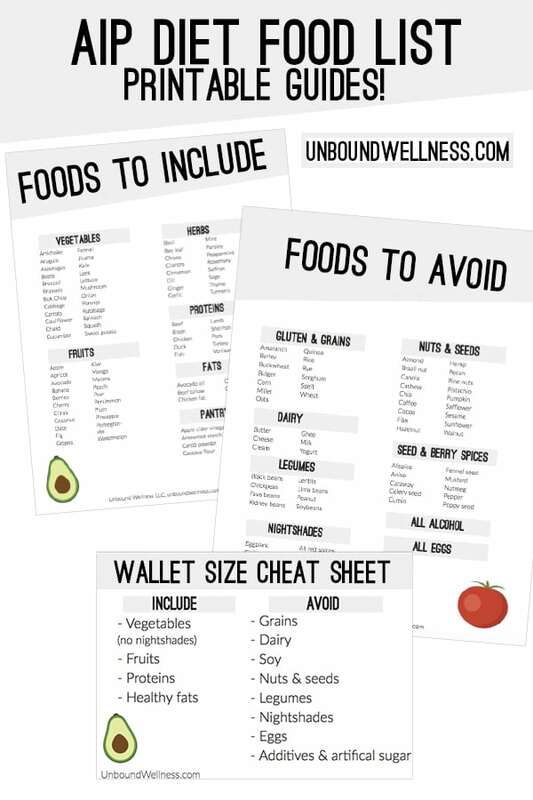 If you’re just starting out with an AIP diet and just need the high level basics, I have a cute little baby wallet sized cheat sheet for you to stash in your purse or pocket. Download the wallet sized cheat sheet here! That’s why I created my e-book Autoimmune Makeover! 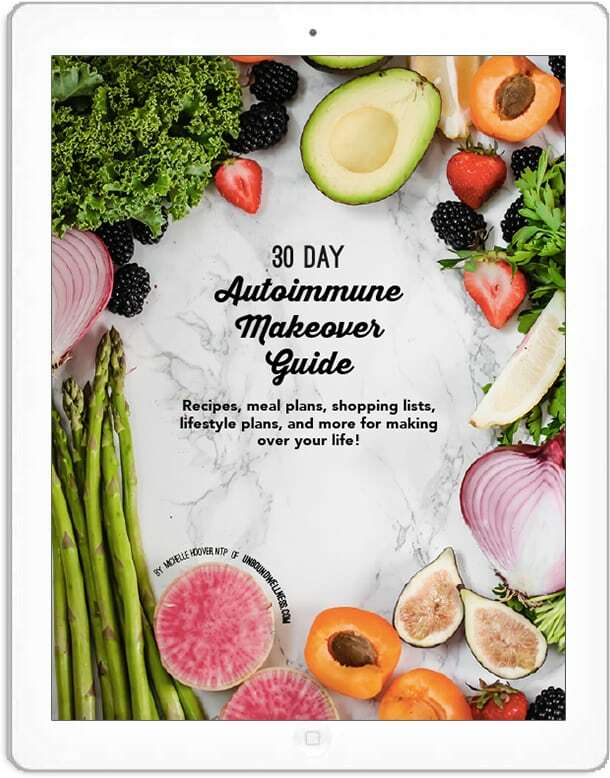 It’s an easy to follow 30 day guide focused on making over your lifestyle with autoimmunity that includes lifestyle recommendations, over 4 weeks of meal plans, shopping lists, 40 + easy and delicious AIP recipes, and more. Get your copy here. Remember… it’s not all about food. This is soo helpful and practical, Michelle, thank you! Hello Michelle,I’m contacting you for my wife who is having thyroid problems. Looking at the diet specifications. Almonds are to be off limits. Coconut milk is that okay? And what do you use as a binder to bake grain free breads and or muffins? what do people eat for breakfast? I have green smoothies in the morning. I put a cup of Frozen mango, 1 banana, 4 cups of spinach, half peeled cucumber, 2 cups of water, and 2 scoops of beef collagen peptides, it’s delicious! Very helpful. Do you have any specific information regarding Sjogren’s Syndrome and dry eyes? Hi Mary! That’s something I would address one on one with a doctor for sure. Hi Mary, I too have Sjogrens. My doctor has me doing several things to help with that. Starting internally. Lots of fluids like bone broth and of course water, Efa supplements, foods high in fat like fish, avocados, coconut oil. You can put coconut oil in your eyes and on your eyelids too. But really you should discuss it with your doctor first. Oh and using a humidifier. Very informative and will look into starting such diet to assist in treating LUPUS erythematosus. thanks for this info! Had Lupus for 32 years never knew there was such a connection ! This is very helpful but there are no breakfast foods left when you take away all dairy and eggs. I cannot eat veggies or broth for breakfast so this has now put me in a place where I am just not eating because I don’t know what to eat. What about Monkfruit sweeteners? They don’t impact blood sugar and I like using it…. Would that be allowed since fruit derived? I think that may be compliant… I’m not 1000% sure so I’d do some more research. Did you find out if Monkfruit sweetener is Autioimmune compliant? Thank you. I recently saw something that said it is not compliant. Thank you so much. This is just what I was looking for- a simple straightforward list of what is and is not allowed so I can pick what will work for us. I will be looking for your blog and recipes to try. Hi. Are sweeteners like Stevia or truvia ok? Technically they’re not AIP. Honey, maple, and coconut sugar are. How long does it normally take the gut to heal? I have a post on that here. I’m trying to find out about bacon that is AI compliant. I can’t find it anywhere in a group. Any suggestions? Thank you for any info. I noticed eggs are on both the AIP “include” list and “avoid” list. I assume they are avoid? Thanks! Great list and very helpful! What do you do if you are vegan? This particular protocol isn’t compatible with a vegan lifestyle. Hi, when you talk about healing with the AIP diet, on average how long does this take? As you mention re introducing certain foods back into the diet e.g. egg yolks. Many thanks for all this information, it has really helped. The minimum is 30 days, but people usually do it for a few months at least. Peanuts are legumes and are not on the diet. Thank you so much Rachel! Sending love on your journey!! I see that rice is on the NO list. Does this include brown rice? Brown rice is out on AIP as well. All grains are removed for the elimination phase. Thank you! Are dairy/lactose free items like yougurt ok? Hi Tabitha, I just do green smoothies in the morning using the beef collagen peptides as a protein source. I usually have a cup of mango, one banana, four cups of spinach, 2 cups of water, half a cucumber peeled, and two scoops of the beef collagen peptides. And this works great for me and it’s yummy too ???? Where do you buy the beef collagen peptides? I’m actually not sure! Sorry! Hey there. I am currently low FODMAP and it has helped my gut function a lot but hasn’t seemed to heal me at all. Would you recommend I continue to stay away from those bothersome foods while doing the AIP diet or just totally switch diets? Thanks so much!! I would recommend working with a doctor to figure out what healing strategies you need. Diet is only one layer, and customized support is crucial. Good luck! thanks for all the info. but what can I drink as coffee is not aloud ? Would someone who has lyme disease follow this diet? Are pinto beans allowed on the AIP diet? I thought buckwheat and sorghum was gluten free? They’re gluten free, but grains and omitted. Hello I was recently diagnosed with Morphea and was told that this diet may help since I had a lot of inflammation in my stomach and esophagus, I never done any diet so when I am told avoid something like carbohydrates I have no idea what that means but this list is very specific and will help me know exactly what and what not to buy so thank you very much but I have a question I like to eat Oatmeal, which is a no no, Corn Meal, which is a no no, and Cream of Wheat, which I don’t know if it’s also a no no since I don’t know what is Spelt Wheat, so can you tell me if it’s ok or not and since I can’t drink coffee or cocoa can I drink hot chocolate and once again thank you for this list. Cream of Wheat would be out on AIP. Any grain is omitted. I’m starting the AIP . It’s not that difficult as I’ve been gluten/dairy free for a long time. Is there any particular reason why I cant tolerate coconut? The effect is pretty quick as it gives me diarrhea. OVer time can this be overcome or can this be an actual allergy. there seems to be so many possibilities with coconut. What about celery not celery seed? Is almond / coconut milk acceptable in AIP? What about oranges? Coconut milk and oranges are fine, but almonds are eliminated. Can you tell me what foods might be causing my insomnia and pain in my legs (restless legs)? Thanks. I just made another about my insomnia and restless legs. I have had insomnia for years. I take prescription medicine for my restless legs and that helps me sleep about 4-5 hours a night. I wake up very tired in the morning. I have been doing a different alimination diet and am now starting week 7. I have hypothyroidism and Hashimoto’s. I would for sure work with a doctor or nutritionist to get to the root cause and lead you through a customized protocol. There are myriad of different factors that I can’t really assess in this space. Is there anything about peanuts or peanut butter? Peanuts are legumes and are omitted. I would for sure work 1:1 with a nutritionist or doctor if you’re dealing with candida. Im working with my holistic gp to improve my hormone issues(endo) I currently am eating paleo, has helped. Im curious about aip because my guts not happy. Brain fog etc. But. I am also vegan, ive opened my horizins to eating omega 3 fishes. But thats my limit. Any advice for doing aip plantbased struggling with variety. My dr suggested going keto. This is a work in progress! Are nut and seed oils/butters compliant if applied to skin and hair? I have been previously using an organic beard balm, and was curious if this would have any effect even though it is not ingested through my gut. Thanks! That’s a good question for sure. We do still absorb things through our skin and I avoid a lot of the same things in those products that I do in food. Everyone is different though!